Join the discussion on our forums! 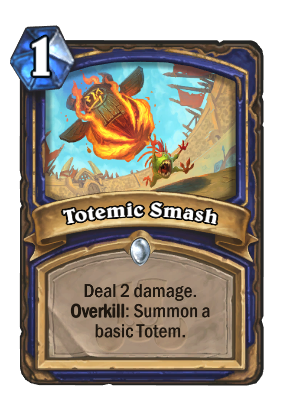 Come discuss Totemic Smash over in our dedicated Totemic Smash discussion topic. Deal 2 damage. Overkill: Summon a basic Totem. Trolls are the first group to have a totem survive atmospheric re-entry. The real question is...if I totemic smash my opponents face and overkill, will it summon a totem for BM? Pretty good card. But, wait?! It can go face, wtf?! So, basically, the challenge is as follow: summon a totem by Overkilling your opponent face ;-) Nice! As far as "2 damage for 1 mana" cards go, it's obviously better than Holy Smite and Arcane Shot, and about on par with Living Roots. It's a good new combo piece for Malygos decks, a neat new support card for the underplayed Windshear Stormcaller, and a decently playable card even without those synergies. Well-designed, well-balanced, well-illustrated, and even well-named... bravo, Team 5! Nice art, it's not that bad either! Living Roots wasn't just good, it was a staple. Will this card not be the same way? Malygos shaman card, nothing more. People are saying 1 mana deal 2 is decent tempo but I don't think in the history of Hearthstone has there been a low damage, low cost, low impact spell that doesn't cycle itself been run for anything but combo. it would be perfectly balanced if Malygos wansn't a thing.